Registration for the 2019 race (and the wait list) are now full. If you still want to be part of the excitement of race day, how about volunteering? Drop us a line! The Lees Trail Triathlon is a short-course triathlon that is open to participants from all athletic backgrounds. We are proud to host a triathlon that’s inclusive, fun and non-intimidating. This event is held in memory of Aaron Webster, a victim of gay bashing. Aaron was murdered in Stanley Park in November 2001, near where our race takes place. Proceeds from this event are donated to the Pride Education Network, who work to make the BC school system more welcoming for LGBTQ students and staff and queer families. Note that because of Triathlon BC and Triathlon Canada limitations on distances for younger athletes, our race is not suitable for athletes under 14 years old. You can find more information about the Kids of Steel (KOS) program from TriBC's website. There are many KOS races available on Tri BC's race calendar throughout the year. The swim takes place in the 3 50-meter lanes in Second Beach Pool. We organize the swim in 3 waves of about 30 athletes each (3 pool lanes x 10 swimmers in each lane). Estimate your swim time when you register. We start the slower swimmers first; the faster swimmers go last. This allows us to keep the athletes from getting too spread out and also helps us finish the race sooner. All athletes swim up and down in the same lane (10 lengths or 5 laps). Stay on the right-hand side of the lane. We will tell you on race morning how to pass (or let someone else pass) in the lane. If your estimated swim time is more than about 12 minutes, you’ll probably be in the first wave, starting at 8.00. If your estimated time is from 9 to 12 minutes, you’ll probably be in wave 2, starting about 8.20. If you expect to complete the swim in under 9 minutes, you’ll likely be in wave 3, starting about 8.35. Each wave waits until all athletes from the previous wave finish. We organize the swim heats based on your estimated swim time, so the more accurate you can make your estimate, the better the chance you'll be in a group of people who swim at the same speed you do. If you really don't know, don't worry -- we'll tell you on race morning about how you can pass and self-organize in your lane so you're not held back too much. Remember, it's supposed to be fun! 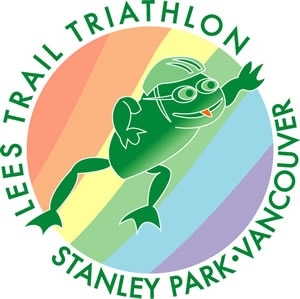 The bike course is one 10-km loop of Stanley Park (from transition, heading east on North Lagoon Drive, then Stanley Park Drive all the way around the park). You will be riding on the road, not on the sidewalk or on the bike path. The course is mostly flat or undulating, with 1 fairly steep climb up to Prospect Point and then a fast downhill back to transition. The course is not closed to traffic, so you will encounter cars and other cyclists. The run consists of 2 2-km loops in the gravel trails of Stanley Park (Bridal Path/Lees Trail/Rawlings Trail). We do our best to have a well-marked route, but athletes are responsible for familiarizing themselves with the course. The entry fee is $70, plus a $15 day-of-race insurance fee for participants who are not current members of Triathlon BC. Our race is sanctioned by Triathlon BC. That means that all rules of Triathlon BC apply. Please familiarize yourself with the TriBC rules here. You cannot wear a wetsuit in our race because the water is too warm (hey, it's a heated pool!) If you just get too cold, even in a pool, we won't stop you from wearing a wetsuit, but your race will be just for fun. You won't receive an official time and you won't be eligible for a prize. (We do this in the spirit of inclusivity). As an age-group race, the bike portion is "draft illegal". Wearing headphones or having music in either the bike or run portion of the race is prohibited. This is a safety issue in case you need to hear instructions from race officials; you will be crossing roads and interacting with traffic during the race. Please help us avoid lineups on race morning by taking advantage of the advance package pickup. We will confirm the date/time and location for advance package pickup with registered athletes via email a few days before the race. Make sure you have a FULL water bottle. During this race there is only ONE water station, as you exit to the run. Note: All the swim starts are approximate, depending on how long the safety briefing takes, and how long the previous swim wave(s) take. Full results and photos will be emailed to racers and posted on the English Bay Cycling Club website after the race. Prizes for top male and female finishers. Stay for the Awards Ceremony as everyone is eligible to win door prizes.